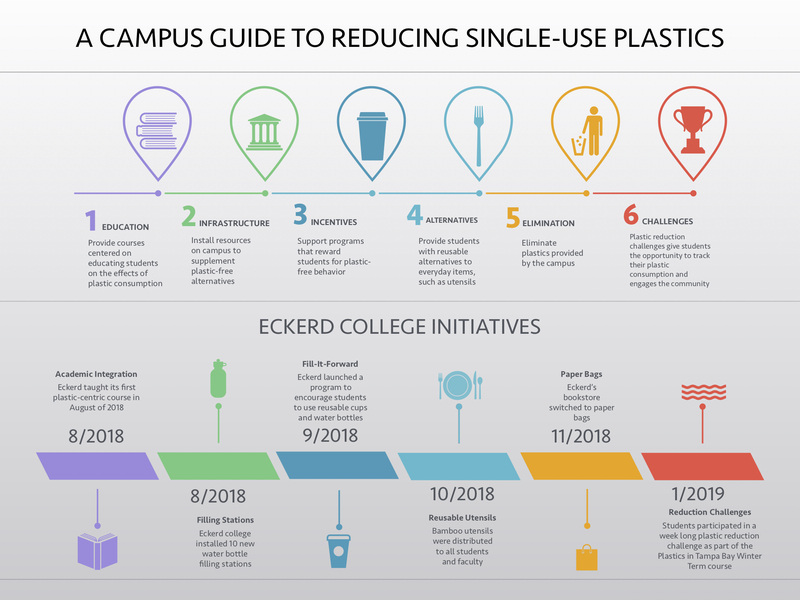 The Eckerd College Reduce Single-Use project has developed a guide for colleges and universities looking to break free from single-use plastic. This guide includes initiatives that institutions can implement to create change from a top-down perspective while also culminating curricula to educate the community on the dangers of plastics. We have also provided a snapshot of Eckerd’s personal timeline of change to illustrate the natural progression our own campus has undergone, and we hope telling our story will inspire other institutions to pursue a plastic-free goal as well. Education is the first wave of attack. By developing and implementing plastic-centric courses that engage students in the plastic problem, the students are given an opportunity to dive into the numbers and realities of the problem in a setting they would maybe not do on their own unless they are very personally interested. Eckerd taught two short-term (three weeks) courses on the plastic problem during the 2018-2019 school year. These classes incentivized students to both learn about plastic by reading papers and participating in beach cleanups as well as examining their own plastic usage by completing plastic reduction challenges. Updating the institution’s infrastructure to better accommodate and encourage plastic-free behavior is another integral step in transitioning. As a part of the grant from the NOAA Marine Debris Program, money was made available for the purchase of an additional 10 water bottle filling stations to be installed around campus. These stations provide students with easy filling that also reminds them to bring their own water bottles instead of opting for a single-use options. Providing prizes for using reusables is a great way to encourage community participation. At Eckerd, we have adopted the “Fill It Forward” program to incentivize students to bring their own cups to places like Starbucks and the Pub. Fill It Forward is an app that students can download, and it provides rewards like Starbucks gift cards and pizza parties for students when they track their reuses. These tangible and tasty rewards, along with badges the students earn for reusing, encourage students to compete with each other and themselves to collect as many prizes as they can. Providing the community with alternatives to plastic is another way to encourage members to break free from plastic. Eckerd met this condition by purchasing a reusable bamboo utensil set consisting of a fork, spoon, knife, and pair of chopsticks for every student, faculty and staff member of the Eckerd community. The utensils, which came in a recycled plastic holding sleeve, were given to students in their mailboxes and to the staff and faculty via their mailboxes. Elimination of plastics provided by the institution can dramatically reduce the amount of plastics used by the community. At Eckerd, we complete monthly observations of high plastic-use areas like the cafeteria, Starbucks, the Bookstore, and the Triton Pub. In the Pub, we have been intimately involved with the removal of the single-use plastic utensils that are available for patrons to use with their meals. However, because the Pub is a “grab-and-go” environment, replacing the plastic cutlery with the washable metal utensils used in the cafeteria would not meet the needs of the space. In order to do so, we decided to provide wooden cutlery as a to-go option alongside a selection of metal cutlery for those eating at the Pub. In this way, we were able to reduce the amount of plastic cutlery available to zero while still providing a single-use cutlery option for those in a rush. Holding group plastic reduction challenges is another tactic to tackling the plastic problem. At Eckerd, we have created a plastic reduction challenge in which participants track their plastic usage for the week and are encouraged to cut down on that usage. This challenge was held for one week each in both of the plastic-centric short term courses Eckerd taught during the 2018-19 school year, and students would discuss their usage each day as a part of the three hour lecture. When the students reviewed the course, they said the physical task of quantifying their plastic usage each day made them more aware of their individual contributions to the plastic problem, and it really opened their eyes to the areas in which they personally needed to step up to refuse plastics. For more information, please visit our website at https://reduce.eckerd.edu/home to see more examples of how we, as an Eckerd community, have moved to break free from single-use plastics.